Chairman of the Parliamentary Sectoral Committee on Natural Resources, Odinga Lumumba (left) speaking with ExxonMobil’s Country Manager, Rod Henson. Opposition parliamentarian, Pauline Sukhai (centre) looks on. Guyana’s parliamentary committee on natural resources committee on Friday heard accusations conflict of interest being levelled against Conservation International because it has taken funds from ExxonMobil, a charge that was flatly rejected by the oil company. Committee Chairman, Odinga Lumumba said he was very disturbed that the United States (US)-based environmental watchdog was engaged in a conflict of interest deal by taking a US$10 million grant from ExxonMobil Foundation to carry out work in Guyana. “You are saying to us today that you know that Conservation International is seen around the world as a watchdog of the environment. You don’t see this as a conflict in partnering with the watchdog? In essence, you have taken CI out of the domain of being a watchdog of any issue in Guyana with oil spills, environmental problems, etc. CI can no longer be a credible factor in this game and I am saying that Exxon being a reputable company, being a strong company and a powerful company must know this,” he said. ExxonMobil’s Country Manager, Rod Henson, however, fended off the claims that his company has essentially bought out the environmental organisation. “Chair, I think Conservation International would disagree with you and I disagree with you respectfully and I don’t think this in any way impedes Conservation International’s other roles in the country,” he said. 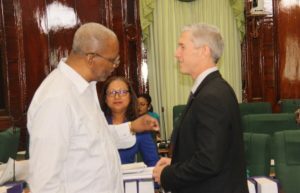 Odinga questioned Henson about whether the agreement between CI and ExxonMobil to fund activities in Guyana was discussed or approved by government to build capacity at the University of Guyana and help diversify the country’s economy. Henson replied, that “this is our ExxonMobil Foundation initiative. This is not directed or approved by the government. This is a good thing. I am not aware that Conservation International has a sole role and a unique role as a watchdog. ExxonMobil uses this organisation or partners with this organisation around the world”. The ExxonMobil official said government was informed about the partnership among the Foundation, University of Guyana and CI, but in the end the oil company chose to do in a transparent manner. ExxonMobil Foundation earlier this month announced that it would contribute US$10 million to a new collaboration with Conservation International and the University of Guyana to train Guyanese for sustainable job opportunities and to expand community-supported conservation. The Foundation said the investment is also intended to support Guyana’s Green State Development Plan, the country’s 15-year development plan that aims, among other things, to diversify Guyana’s economy and balance economic growth with the sustainable management and conservation of the country’s ecosystems.